Haredi MK Yisrael Eichler claims Shabbat construction work controversy manufactured by Likud ministers trying to topple Netanyahu. 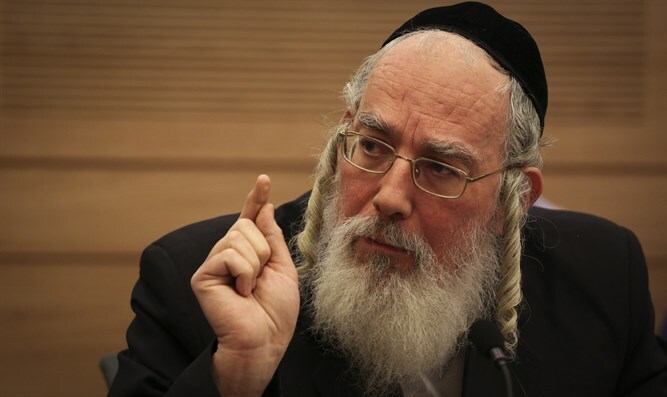 MK Yisrael Eichler (United Torah Judaism) blamed Likud ministers Yisrael and Haim Katz for the recent controversy over railway repairs on Shabbat, contending that they engineered the crisis in order to topple current Prime Minister Binyamin Netanyahu. The haredi UTJ had threatened to quit the coalition if the state-owned Israel Railways continued to conduct construction work on Shabbat. "There is no explanation that the Likud government will expand the work done on Shabbat except for the attempt by the Transportation Minister and Welfare Minister to topple the government. The traditional Likud voters will not forgive them if Netanyahu's government falls apart," charged Eichler. Eichler's comments ascribing the impasse to political maneuvering were echoed by Coalition Chairman MK David Bitan (Likud), a close Netanyahu ally, who said that "these ministers could have dealt with this problem six months ago, yet they decided to do nothing in order that Netanyahu would have to act". Netanyahu has feuded with Transportation Minister Yisrael Katz in the past over allegations that Katz was intentionally creating problems with the railways in order to undermine Netanyahu for his own political aims. Yisrael Katz has made his intention to replace Netanyahu clear and announced in October that "I intend to run for the leadership of the Likud and for prime minister as soon as Binyamin Netanyahu resigns" and has attempted to change the laws governing the Likud in order to wrest powers away from Netanyahu. On Monday, Prime Minister Binyamin Netanyahu hammered out a comprehensive agreement with his haredi coalition partners Sunday evening in an effort to end an ongoing coalition crisis brought to a head Sunday morning by the resignation of Health Minister Yaakov Litzman (United Torah Judaism). Litzman quit Netanyahu’s government Sunday after the state-owned Israel Railways conducted infrastructure work over the Sabbath. Following Litzman’s resignation, Shas chief and Interior Minister Aryeh Deri and Finance Minister Moshe Gafni (United Torah Judaism) announced they would boycott the coalition’s weekly meeting of party leaders, citing the government’s failure to halt work on the Sabbath by the state-owned Israel Railways company, as well as the coalition’s failure to advance legislation restricting the ability of stores to skirt laws prohibiting business on the Sabbath.